While most of the Western media describes the current crisis in the Ukraine as a confrontation between authoritarianism and democracy, many of the shock troops who have manned barricades in Kiev and the western city of Lviv these past months represent a dark page in the country's history and have little interest in either democracy or the liberalism of Western Europe and the United States. "You'd never know from most of the reporting that far-right nationalists and fascists have been at the heart of the protests and attacks on government buildings," reports Seumas Milne of the British Guardian. 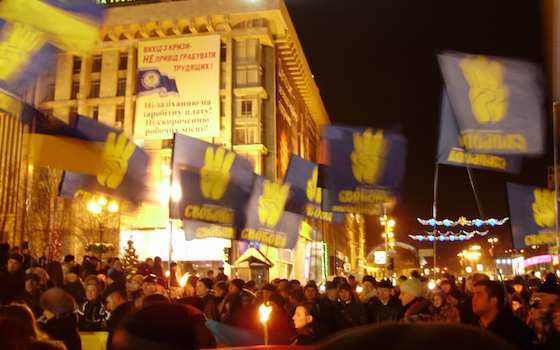 The most prominent of the groups has been the ultra-rightwing Svoboda or "Freedom" Party. And that even the demand for integration with Western Europe appears to be more a tactic than a strategy: "The participation of Ukrainian nationalism and Svoboda in the process of EU [European Union] integration," admits Svoboda political council member Yury Noyevy, "is a means to break our ties with Russia." Svoboda is hardly a fringe organization. In the 2012 election won by the now deposed president, Viktor Yanukovitch, the Party took 10.45 percent of the vote and over 40 percent in parts of the western Ukraine. While the west voted overwhelmingly for the Fatherland Party's Yulia Tymoshenko, the more populous east went overwhelmingly for the Party of the Regions' Yanukovitch. The latter won the election handily, 48.8 percent to 45.7 percent. Svoboda -- which currently has 36 deputies in the 450-member Ukrainian parliament -- began life in the mid-1990s as the Social National Party of the Ukraine, but its roots lie in World War II, when Ukrainian nationalists and Nazis found common ground in the ideology of anti-communism and anti-Semitism. In April, 1943, Dr. Otto von Wachter, the Nazi commander of Galicia -- the name for the western Ukraine -- turned the First Division of the Ukrainian National Army into the 14 Grenadier Division of the Waffen SS, the so-called "Galicia Division." The Waffen SS was the armed wing of the Nazi Party, and while serving alongside the regular army, or Wehrmacht, the Party controlled the SS's 38-plus divisions. While all Nazi forces took part in massacres and atrocities, the Waffen SS did so with particular efficiency. The post-war Nuremberg trials designated it a "criminal organization." Svoboda has always had a soft spot for the Galicia Division and one of its parliament members, Oleg Pankevich, took part in a ceremony last April honoring the unit. Pankevich joined with a priest of Ukrainian Orthodox Church near Lviv to celebrate the unit's 70th anniversary and re-bury some of the Division's dead. "I was horrified to see photographs…of young Ukrainians wearing the dreaded SS uniform with swastikas clearly visible on their helmets as they carried caskets of members of this Nazi unit, lowered them into the ground, and fired gun salutes in their honor," World Jewish Congress President Ronald Lauder wrote in a letter to the Patriarch of the Ukrainian church. He asked Patriarch Filret to "prevent any further rehabilitation of Nazism or the SS. The U.S. press has downplayed the role of Svoboda, and even more far right groups like Right Sector and Common Cause, but Britain's Channel 4 News reports that such quasi-fascist groups "played a leading role" in organizing the demonstrations and keeping them going. In the intercepted phone call between U.S. Assistant Secretary of State for European Affairs Victoria Nuland and U.S. Ambassador to the Ukraine, Geoffrey Pyatt, the two were, as Russian expert Stephen Cohen put it to Democracy Now, "plotting a coup d'état against the elected president of the Ukraine." At one point Nuland endorses "Yat" as the head of a new government, referring to Arseniy Yatsenyuk of the Fatherland Party, who indeed is now acting Prime Minister. But she goes on to say that Svoboda leader Oleh Tyahnybok should be kept "on the outside." Tyahnybok is an anti-Semite who says "organized Jewry" controls the Ukraine's media and government, and is planning "genocide" against Christians. He has turned Svoboda into the fourth largest party in the country, and, this past December, U.S. Senator John McCain shared a platform and an embrace with Tyahnybok at a rally in Kiev. Svoboda has links with other ultra-right parties in Europe through the Alliance of European National Movements. Founded in 2009 in Budapest, the Alliance includes Svoboda, Hungary's violently racist Jobbik, the British National Party, Italy's Tricolor Flame, Sweden's National Democrats, and Belgium's National Front. The Party also has close ties to France's xenophobic National Front. The Front's anti-Semitic leader Jean-Marie Le Pen was honored at Svoboda's 2004 congress. Svoboda would stop immigration and reserve civil service jobs for "ethnic Ukrainians." It would end abortion, gun control, "ban the Communist Ideology," and list religious affiliation and ethnicity on identity documents. It claims as its mentor the Nazi-collaborator Stephan Bandera, whose Ukrainian Insurgent Army massacred Jews and Poles during World War II. The Party's demand that all official business be conducted in Ukrainian was recently endorsed by the parliament, disenfranchising 30 percent of the country's population that speaks Russian. Russian speakers are generally concentrated in the Ukraine's east and south, and particularly in the Crimean Peninsula. The U.S. and the EU have hailed the resignation of President Yanukovych and the triumph of "people power" over the elected government -- Ambassador Pyatt called it "a day for the history books" -- but what is sauce for the goose is sauce for the gander. Prior to the deployment of Russian troops this past week anti-coup, pro-Russian crowds massed in the streets in the Crimea's capital, Simferopol, and seized government buildings. While there was little support for the ousted president -- who most Ukrainians believe is corrupt -- there was deep anger at the de-recognition of the Russian language and contempt for what many said were "fascists" in Kiev and Lviv. The Ukraine is in deep economic trouble, and for the past year the government has been casting about for a way out. Bailout negotiations were opened with the International Monetary Fund (IMF) and the European Union (EU), but the loan would have required onerous austerity measures that, according to Citibank analyst Ivan Tchakarov, would "most probably mean a recession in 2014." It was at this juncture that Yanukovych abandoned talks with the EU and opened negotiations with the Russians. That turnaround was the spark for last November's demonstrations. But as Ben Aris, editor of Business News Europe, says, "Under the terms of the EU offer of last year -- which virtually nobody in the Western media has seriously examined -- the EU was offering $160 million per year for the next five years, while just the bond payments to the IMF were greater than that." Russia, however, "offered $15 billion in cash and immediately paid $3 billion…Had Yanukovych accepted the EU deal, the country would have collapsed," says Aris. Border security is hardly ancient history for the Kremlin. As Russian expert Cohen points out, "Since the Clinton administration in the 1990s, the U.S.-led West has been on a steady march toward post-Soviet Russia, beginning with the expansion of NATO…all the way to the Russian border." NATO now includes Croatia, Estonia, Latvia, Lithuania, Hungry, Slovenia, and former Soviet-led Warsaw Pact members Albania, Slovakia, the Czech Republic, Poland and Romania. NATO Secretary General Anders Fogh Rasmussen's comment that the IMF-EU package for the Ukraine would have been "a major boost for Euro-Atlantic security" suggests that NATO had set its sights on bringing the Ukraine into the military alliance. The massive demonstrations over the past three months reflected widespread outrage at the corruption of the Yanukovych regime, but it has also unleashed a dark side of the Ukraine's history. That dark side was on display at last year's rally in Cherkasey. Victor Smal, a lawyer and human rights activist, said he told "the men in the T-shirts they were promoting hatred. They beat me to the ground until I lost consciousness." Svoboda and its allies do not make up a majority of the demonstrators, but as Cohen points out, "Five percent of a population that's tough, resolute, ruthless, armed, and well funded, and knows what it wants, can make history." "The Dark Side of the Ukraine Revolt"